Living on your own for the first time doesn’t have to be a cause for panic. Many emergencies are manageable if you’re prepared, know what steps to follow, and know where to go or who to call. Of course, not all accidents are preventable, but there are steps you can take to make sure that you are fully equipped to deal with medical emergencies. Before you head to college, visit your doctor for an annual checkup. Your college may require documentation from a doctor that proves you’ve received a checkup within the last year. Seeing your doctor, even if you feel healthy, is a great way to be confident about your health as you head to college. You can confidentially voice your concerns and get advice about vitamins, healthy eating, exercise, birth control, mental health, etc. Ensure that your vaccinations are up to date. The Centers for Disease Control and Prevention (CDC) recommend certain immunizations for children. If you are about to start college, make sure that you have completed or have been given a chance to complete all of the recommended vaccinations. When it comes to college students, four vaccinations are particularly important: MenACWY, Tdap, HPV, and seasonal flu shots. Learn more about each of them here. If you have a chronic illness (e.g., diabetes, blood disorders, epilepsy) or serious allergies to medicine or food, you might consider wearing a medical alert bracelet or necklace. This will help providers treat you if you are unresponsive. Medical IDs can be purchased from a variety of stores, including American Medical ID and Lauren’s Hope. For students attending college in their hometowns, you’ve already built a relationship with your primary care physician. If you’re away from home, you may need to find a new doctor. Your campus health center might have primary care physicians on staff. Otherwise, ask them to recommend a few doctors in the community. You can also research them online by checking their patient reviews. Call your insurance company to verify that the doctor is in-network, then follow up to see if they are accepting new patients. Tour the campus health center. Almost all brick-and-mortar colleges have student health resources on campus. There may be a clinic staffed with doctors and nurses or a mental health resource center with counselors, therapists, and psychiatrists. Stop by each campus office for more information. The staff will be happy to tell you what services are offered, what insurance is accepted, and what out-of-pocket costs you can expect. They might also have schedules for free flu shots or sessions with a nutritionist. Write out a list of emergency numbers. Familiarize yourself with all of the emergency and health resources on and around campus, then draw out a master list. Save each individual number in your phone, but also keep a hard copy in a safe place. Know who to call when you need medical treatment. You need to know who to call when you need treatment. Consider your primary care doctor for non-life-threatening, nonurgent medical questions; learn the location of the nearest urgent care facility for non-life-threatening but urgent medical problems; and learn the location of the nearest hospital for life-threatening or urgent medical problems. It can be hard to know which facility to go to for what type of medical problem. This infographic and the information below aims to make the correct choice obvious. Primary Care Physician: Typically your primary care physician (PCP) should be your first stop for physicals, immunizations, chronic disease care, and illness prevention. You can also visit your PCP if you are sick and can get an appointment during the week. Many PCPs are affiliated with or can recommend hospitals if your condition requires urgent medical care. Urgent Care: If you are experiencing a medical problem for which you would normally see your primary care doctor (strep throat, mono, urinary tract infection, sprains, flu) but you don’t want to have to wait for an appointment or it’s over the weekend, you should visit an urgent care clinic. 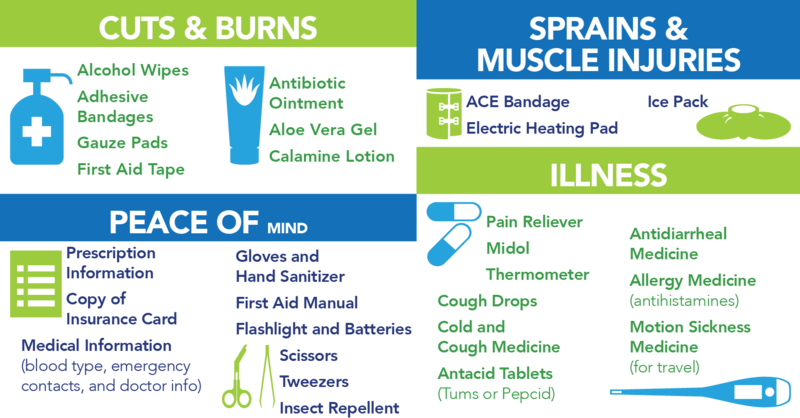 Many of these illnesses can also be taken care of at your college’s student health clinic. Emergency Room: The emergency room should only be visited during true emergencies: broken bones, chest pain, nonstop or heavy bleeding, burns, seizures, lacerations that need stitches, head injuries, etc. If you suspect appendicitis, visit the emergency room. If you moved to an unfamiliar city to attend college, take the time to learn about its emergency resources. Use Google Maps to locate your campus and create pinpoints for the nearest pharmacy, hospital, urgent care clinic, and doctor’s office. Are any of the resources open 24 hours? Print your map and tape it to your mini fridge or closet door to grab in case of an emergency. Otherwise, save it to your phone so that you can enter the addresses in your GPS should you need them urgently. Build your own first aid kit for minor injuries and illnesses. Do-it-yourself first aid should never be substituted for emergency services in a dire situation, but a good first aid kit can help you treat yourself or a friend until you can make it to a doctor. Some companies sell preassembled first aid kits, but you can also choose to put one together yourself so that it is specific to your needs. *You can find an expanded version of this graphic here and in our Printable Resources section. Save emergency cash for emergency spending. Having health insurance is the first thing you can do for yourself to prepare for an emergency. Familiarize yourself with your coverage. Some information is listed right on your insurance card. How much is your co-pay to see a doctor? What is the co-pay for an emergency room visit? The latter typically costs between $150.00 and $300.00 (and that’s just the co-pay; the full bill, including the cost of any treatment and medical attention that isn't covered by your insurance provider, will be mailed to you later). Make sure you have this amount of money stashed in an easy-to-access account, just in case. Touch it only should an emergency situation arise. Depending on the urgency of your condition, you may be asked to make the co-pay before a doctor will see you. 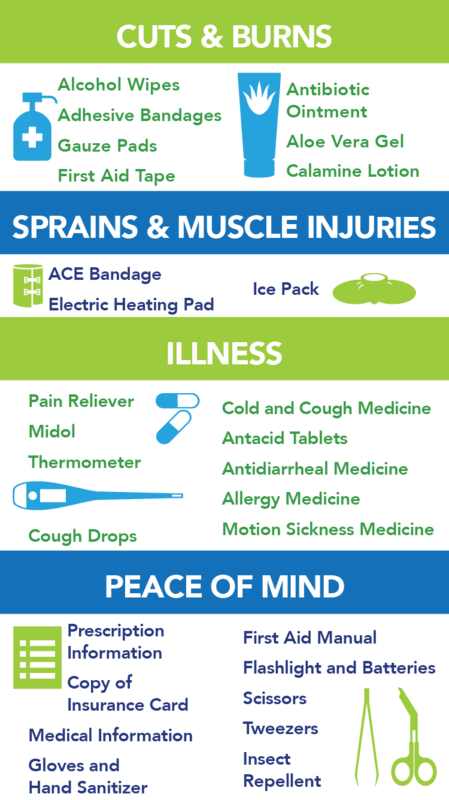 Take a first aid, CPR, or Wilderness First Responder class. You can get medically certified even if you aren’t studying medicine or nursing. Some colleges may offer CPR certification for credit. Others may offer discounted CPR classes through the school gym’s programming. If your college doesn’t participate in a CPR-certification program, the Red Cross, National Outdoor Leadership School, and the American Heart Association help people connect with courses in their areas.